I often dive in cold dark waters. Once or twice, I got disoriented on a wreck and had some difficulty finding the up line. Also, after reading a few reports of survival at sea, I figured out having a strobe at the surface would also be a good thing. I tried a few strobes and settled on the ACR Electronics Firefly Plus. While not a dive specific strobe, people seem to agree that this is one of the top choices for diving. The Firefly Plus (find the Spec Sheet here) is well built and doesn’t seem to be plagued with the flooding issues that many more expensive strobes have. It doesn’t mean that you shouldn’t maintain the strobe’s oring and be generally careful. 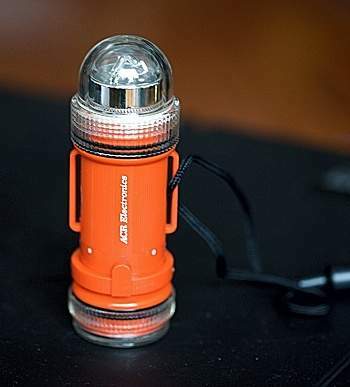 The Firefly Plus is small and light (5.3 x 1.5 in and 5 oz), sports a strobe (bright! ), a flashlight (useless underwater), is slightly positively buoyant and withstand depths of up to 330ft (100m). I didn’t take it to such depth but used it at 100+ feet in poor visibility waters and it worked well, the strobe light showing me the upline from quite a distance. The Firefly 3 doesn’t come with an adequate way to tie the strobe to the upline or a wreck. A bit of bungee cord solves that problem. The dive light operates on 2 AA alkaline or 2 AA lithium batteries and the strobe is supposed to work for 10 hours. I haven’t tested that, I have to say. The flashlight is pretty much useless unless you want to signal at sea I guess. In any case, the Firefly 3 is an inexpensive and good strobe light. At $32 or so, it costs less than half of the alternatives and holds up well against the competition. I always have one on me whether it is to mark the upline or as a safety should I get lost at sea. You’ll see the low-yield incandescent light on other ACR strobes too. If you ever need to be resuced from the water, the strobe will summon and guide help from a considerable distance – but when the rescuers get close, it’s blinding (bad for helicopter pilots!). When help arrives you should switch from strobe to flashlight so you’re still visible, but not making things hard by dazzling the people trying to help you. Copyright 2008 Erik Dasque and Sam Clemens :: powered by Wordpress and the The Unstandard theme. :: | | 56 queries. 1.009 seconds.